ICD-10 for Substance Abuse & Mental Health Providers - Outsource Management Group, LLC. The Substance Abuse and Mental Health Services Administration (SAMHSA) has published a new fact sheet designed to help mental health and substance abuse service providers make the transition to the new International Classification of Diseases, 10th Edition (ICD-10) code sets. ICD-10 will affect all diagnosis and inpatient procedure coding for everyone involved in mental health and substance abuse healthcare under HIPAA. However the change to ICD-10 does not affect CPT coding for outpatient procedures. All services provided for either substance use or mental disorders are subject to HIPAA standards; therefore, all mental health and substance abuse providers must shift to ICD-10 once it becomes effective on October 1st. SAMHSA’s new fact sheet contains information explaining the transition to ICD-10, what it entails, why it’s important to behavioral health providers and how it will affect them in practice. “ICD-10-CM/PCS (International Classification of Diseases, 10th Edition, Clinical Modification/ Procedure Coding System) consists of two parts for diagnosis (CM) and inpatient procedure coding (PCS). Diagnosis coding under ICD-10-CM uses 3 to 7 digits instead of the 3 to 5 digits used with ICD-9-CM and the format of the code sets is similar. 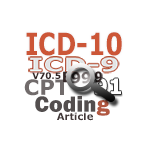 Why is ICD-10 being substituted for ICD-9, which is currently in use? ICD-9 produces limited data about patients’ medical conditions and hospital inpatient procedures ICD-10 coding is much more specific and detailed in terms of diagnoses and can be used for pay-for-performance and bio-surveillance. When does this start? October 1, 2014. After this date, ICD-9 codes in current use will no longer be accepted for diagnostic and billing purposes. Why is this important to behavioral health providers (i.e., providers of services for substance use and mental disorders)? ICD-10 will affect diagnosis and inpatient procedure coding for everyone covered by the Health Insurance Portability Accountability Act (HIPAA). The change to ICD-10 does not affect CPT coding for outpatient procedures. However, all of the services provided for either substance use or mental disorders are subject to HIPAA standards; therefore, behavioral health providers must shift to ICD-10 on October 1, 2014. What should a mental health provider be doing to prepare for ICD-10? The Centers for Medicare and Medicaid Services recommends developing an implementation strategy that includes an assessment of the impact on your organization, a detailed timeline, and a budget. Check with your billing service, clearinghouse, or practice management software vendor about their compliance plans. Providers who handle billing and software development internally should plan to utilize appropriate resources for medical records/coding, clinical, IT, and finance staff to coordinate ICD-10 transition efforts. How will providers know how to use ICD-10 codes in practice? Mental health and substance abuse providers will have access to the Diagnostic and Statistical Manual of Mental Disorders-5 or DSM-5. The manual includes all ICD-10 codes for mental health and substance use disorders that will be utilized in a practice setting. Want my advice? Do your practice a huge favor right now and prepare as much as you possibly can for the ICD-10 transition. No one will be “too prepared”. If you don’t act soon, I can honestly say that you will have a significant lapse in revenue beginning in October. For more on its services and ICD-10 assistance program visit SAMHSA.